This town is loosely based on Millbrook, NY, my old home town. The train no longer runs through Millbrook, but I was able to recreate the train station and platform using vintage postcards. It was fascinating to see that the long-dismantled railroad tracks ran behind warehouses still in existence. The town depicted here for American Girl’s Welcome to Samantha’s World - 1904 is larger than Millbrook; I added an extra street behind Franklin Avenue (Main Street). Per the illustration requirements, I had to move some buildings and add others. 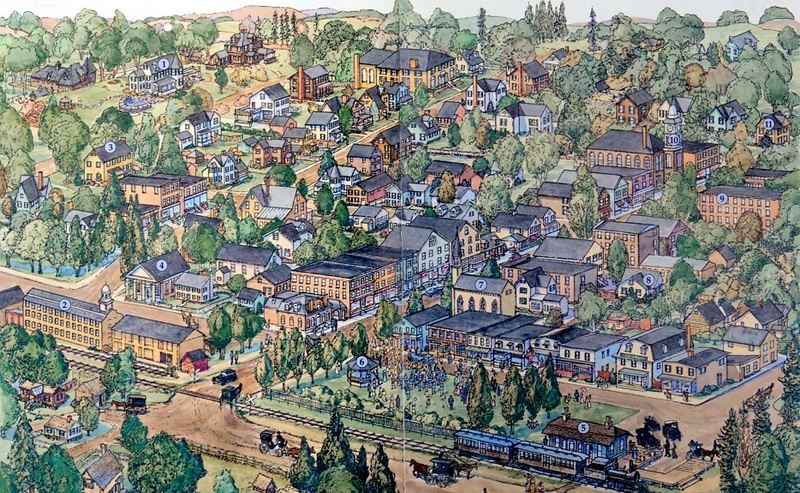 My former home (white with a turret and labeled #1) and brown barn behind are at the upper left of the illustration. Next door is my neighbor Elinor’s home (brown). Both are fairly accurately depicted but not where they should be relative to town.